Many adults with Asperger’s (high-functioning autism) will admit that they have an anger-control problem. It’s not uncommon for them to experience an array of negative emotions (e.g., anger, anxiety, depression). There are many possible causes for this. It may be due to genetics, environmental issues, childhood-related issues, personal choice, low-frustration tolerance – and of course, due to the disorder itself. Most likely, negative emotions are the result of a combination of these factors. 1. “Aspies” can be extremely sensitive to loud noise, strong smells, bright lights, and other troubling environmental stimuli. This can be a challenge in relationships, because they may be limited in where they can go, how well they can tolerate the environment, and how receptive they are to interpersonal interactions. 2. Frustration and anger is prevalent in Aspies when rituals can't get accomplished or when their need for order and symmetry can't be met. Aggravation (usually over little things that don't bother others) may lead to a “meltdown” – and even physical violence on rare occasion. 3. Many adults on the spectrum were physically and socially awkward during adolescence, which made them the frequent target of school bullies. Low self-esteem caused by being rejected and teased by their friends and classmates often made them susceptible to anger, depression, and anxiety – and they may carry the scars of that past abuse into adulthood. 4. Most adults on the spectrum develop a special interest that may be unusual in focus or intensity. They may become so obsessed with their particular area of interest that they may get upset and angry when something or someone interrupts their activity. 5. Poor “adaptability-skills” is yet another issue. When structure and consistency are disrupted in the Aspie’s life, the world becomes confusing and overwhelming – thus launching him into a less than optimal response. The disruption of structure can be obvious (e.g., having to get up at an unusual hour, not being able to engage in a favorite activity, being made to go a different way to work due to a traffic jam, etc.) …or it may be hidden (e.g., sensory sensitivities, subtle changes in the environment which the person is used to, etc.). Many of these “triggers” may be out of the control of the Aspie. Thus, it’s important to remember that low-frustration tolerance and similar behaviors are not cases of “rude behavior” necessarily, rather they may simply be natural reactions to various unwanted stimuli. 6. Most of these adults suffer from “mindblindness,” which means they have difficulty understanding the emotions others are trying to convey through facial expressions and body language. The problem isn’t that they can’t feel emotions, but that they have trouble expressing their emotions, as well as understanding the emotions of others. “Mindblindness” often gives their partner or spouse the impression that they are insensitive, selfish or uncaring. 7. Part of the problem stems from a conflict between longings for social contact and an inability to be social in ways that attract friendships and romantic relationships. Many Aspie men, for example, have a desire to date and procure a steady girlfriend, but their “odd” attitudes and behaviors prevent them from doing so. This, of course, is both frustrating and disheartening for the Aspie such that he often stops trying to establish romantic relationships in order to avoid disappointment. 8. Social conventions are a confusing maze for adults on the spectrum. They may take jokes and exaggerations literally, struggle to interpret figures of speech and tones of voice that “typical” people naturally pick up on, or have difficulty engaging in a two-way conversation. As a result, they may end up fixating on their own interests and ignoring the interests and opinions of others. 9. Some adults on the spectrum have what is referred to as “low-frustration tolerance.” In other words, they have a short fuse, are easily irritated, and do not tolerate even the most minor frustrations well. When the frustrating event occurs, they may have a thought or some belief that increases their frustration level (e.g., "This is too much" … "Things must go my way, and I can’t stand it when they don't" … "My partner/spouse should stop doing things that annoy me" … "It shouldn't be this way" … "It shouldn't be this difficult" … "I can't wait that long" … "I can't take this" … "I can't stand being frustrated, so I must avoid it at all costs"). 10. The typical Aspie tends to rely on routine to provide a sense of control and predictability in his life. When there is an unwanted change to his routine, he may become anxious and upset. 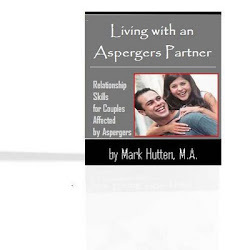 Some adults with Asperger’s have been misunderstood and/or mistreated to one degree or another throughout their life. The mistreatment started as bullying in school, and continued in the workplace. So, their anger is understandable (but doesn’t give them license to be abusive to others in return). Anger is triggered by people, events, or circumstances that make the Aspie feel vulnerable in some way. He may lash out in anger to prevent others from becoming aware of his vulnerabilities. But, once his anger has run its course and he returns to his rational state of mind, he is left to deal with the repercussions of whatever situation triggered his anger. In the world of Asperger’s, sometimes these repercussions are grim and life-changing (e.g., job loss, separation, divorce, jail, etc. ).